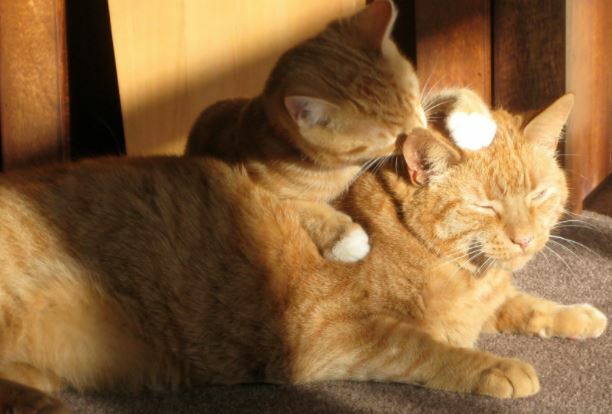 Homepage / Cat / Why do Cats Lick each Other? Let’s discuss these topics in more detail below. How do cats lick themselves? Cats are naturally clean beings. They dedicate about a third of their time to personal hygiene. This habit is an instinctive attitude originating in the cat’s wild ancestors. In nature, after the meal, the cat licks itself in order to remove food remains and to mask the scent of the hunt that could attract predators. To accomplish this task, the felines are well equipped and adapted. Its spine is flexible and allows you to bend in the caricature positions to reach the most difficult places. When this is not possible, as in head hygiene, use the front paws to do so. To do this, moisten the inside of one of the front legs and pass it in upward and circular motions in an area of the head, ending with cleaning the paw. Repeat this process several times and change paw to clean the opposite side. When encountered by the embarrassed, clinging dirt or parasites, cats may resort to the teeth. Lastly, the cat’s tongue is special and works as a comb. The cat’s tongue has hairiness, keratin spicules, called papillae that work like a brush. The papillae give the rough touch to the tongue and have a function to keep the hair soft, remove dirt and parasites (preventing its proliferation) and waterproof the hair. Cats usually lick themselves with an order: head, forepaws, shoulders, genital area, hind legs, and tail. But this order may vary and not all of them will have to be cleaned at once. Cat ancestors used personal hygiene as a way to avoid attracting predators. But predators are neither relevant nor dangerous to the modern domestic cat. So why do cats lick each other? There are several advantages of cat licking. Licking the fur continues to be an advantageous behavior for the cat since it allows you to clean the coat and keep it shiny and soft. In this process, the cat removes parasites, debris and dead and stimulates the blood circulation in the skin and the growth of the hair. When licking, cats stimulate the glands attached to the root of the hair to release secretions that help waterproof the cat. This allows you to keep your body dry even if your hair is slightly wet. The worship of cats by sunbathing is not only due to pleasure. The truth is that when they are in the sun the hair of cats produce Vitamin D. Vitamin D is important for the physiology of calcium in the body, helping the deposition in the bone, increasing its digestive absorption, decreasing the loss through the urine and regulating the concentration in the blood. Vitamin D is produced by the body through sun exposure, however, it is also present in foods such as fish, liver, eggs and dairy products. You do not have to worry about making vitamin D supplements for your cat as commercial pet foods provide it. In fact, excess vitamin D can be toxic, causing vomiting, diarrhea, loss of appetite, increased water intake and urine volume. The process of absorption of vitamin D from the hair takes place in three steps. Initially, the hair absorbs solar UV radiation during sunbathing. There is then a reaction to the natural oils of the skin occurring synthesis of the vitamin. Finally, the cat licks its hair by ingesting the vitamin. Cats lick themselves more in situations that feel hot, such as in hot weather or after exercise (eg, play, hunting). When the cat licks itself, it deposits saliva in the hair that is evaporated and allows to reduce the body temperature. Saliva works just like sweat and helps regulate the cat’s body temperature. Cats like to lick because it is a habit and leaves them relaxed. When the cat is anxious, it may lick itself as a way of relieving tension. Stress can lead cats to lick excessively causing pathologies. Cat licking is a way for the cat to communicate with the rest of his family. Lamber has several meanings, one of which is showing affection. Previous post I Want to Buy a Kitten, What to do? Next post Why Cats are better than Dogs?